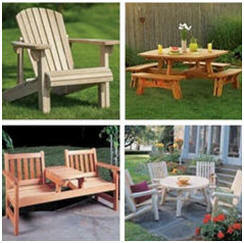 Find hundreds and hundreds of the Internet's best outdoor project plans and how-to lessons. From little bird houses to big yard barns, and just about anything in between, you'll find it here. 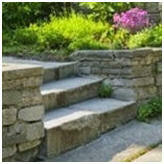 Just scroll down to find the perfect improvement project for your deck, patio, porch, landscape or garden. Learn how to plan and build a sturdy and attractive brick barbecue in your backyard. This step-by-step guide by Matt Weber of Extreme How-To Magazine is filled with helpful tips and techniques. Here’s just one of the lists and lists of great, free backyard how-to hints and do-it-yourself projects, organized for you at DIY Cozy Home. 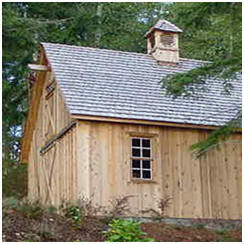 Get building plans and design ideas to help you build any of a dozen different smokehouses. Bake bread, pizza and whatever else you want in your own outdoor oven dome. You'll find a complete building guide at Living Green and Frugally. Here are some interesting designs from all over Internet. Check out free, do it yourself plans and building guides for fire pits, barbecues, smokers and outdoor ovens. You're sure to find one that will boost your enjoyment of your backyard. 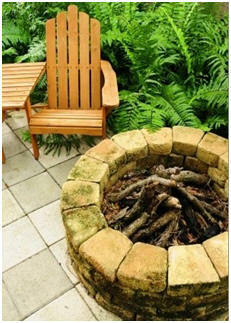 Follow Extreme How-to Magazine's illustrated step-by-step guide and create a backyard feature that everyone can enjoy. Host great barbecues and outdoor parties. Make deck and patio dining easier. Build any of these grill tables, cookout carts and backyard cabinets from do-it-yourself woodwork plans with illustrated instructions. Get free, instant download, do-it-yourself building plans for a classic dog house from Georgia-Pacific. The plans include detailed drawings, material lists, safety advice and how-to hints. ToolCrib.com lists some of the best do-it-yourself dog house plans available. They have simple a-frame dog houses, insulated structures, building guides, a multi-dog plan, a fancy Victorian style dog house and a bunch of more traditional designs. There are even a couple of shady, open-side canine verandas for warm climates. Lee Swindel is a woodcrafter, designer and woodworking teacher with over thirty years experience. He's available online to answer your questions about the projects. His attractive designs seem to make the most of a small amount of wood and work. He includes step-by-step instructions and a list of materials you'll need for each projects. WayneOfTheWoods.com offers woodworking tools, hardware and great how-to-advice. Their free do-it-yourself woodwork project plans include a simple, insulated dog shelter that you can build with plywood. Here's a bunch of free doghouse plans from all over the Internet. You can check them out and then build your favorite for your pet. 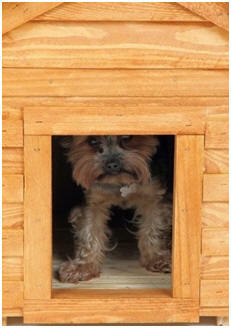 The log cabin style doghouse shown in the thumbnail, by DIYNetwork, is just one of the great designs you'll find. Here’s a project that’s easily accomplished in one weekend. Make it a family project. Your four-legged best friend will be the envy of the neighborhood. The folks at DIYCozyHome.com search the Internet to find and create fantastic lists of free projects and helpful how-to guides for you. Then, they post them on DIYCozyHome.com. Check out some of the great gardeners' do it yourself projects that they found. Birds & Blooms Magazine is packed with practical information for bird watchers and bird lovers. In addition to good advice, they offer do-it-yourself project plans for thirty-five different styles of bird houses, bird feeders and bird baths. 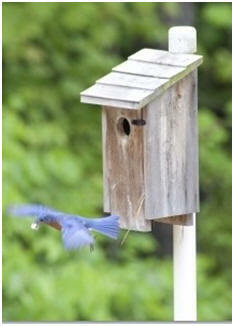 Build a Gravity Feeder and Birdhouses with the help of free plans from Popular Woodworking Magazine. Build a bird house, bird feeder or feeding table with easy free plans from Amateur Woodworking Magazine. Get free, instant download, do-it-yourself building plans for a classic bird house from Georgia-Pacific. The plans include detailed drawings, material lists, safety advice and how-to hints. WayneOfTheWoods.com offers woodworking tools, hardware and great how-to-advice. Their free do-it-yourself woodwork project plans include a simple bird feeder you can build yourself. Add an elegant focal point to your landscape. Build your own gazebo, shade pergola, arbor or vine-covered arched gateway. Just click on the gazebo to check out a list of dozens of beautiful designs with free building plans. Learn how to build dozens of helpful garden tools, garden markers, accessories and small storage bins. Find easy ways to attract butterflies and song birds to your yard. Get free tips, hints and good advice on creating and maintaining perfect gardens. Learn how to build and use raised garden beds, cold frames and compost bins. Create a beautiful vegetable garden that's a decorative feature in your landscape. Learn how to have the best harvest of vegetables, herbs and small fruits year after year, from your own backyard. Free DIY Garden Planter, Garden Bench and Potting Bench Project Plans Build your own beautiful wooden planters for your porch, deck, patio or yard. Choose from dozens of great designs for window boxes, garden benches and potting benches. Then, build your favorites from free plans and step-by-step instructions. Learn how to have amazing gardens, flowers, water gardens, herbs, fresh vegetables and small fruit in the tiniest of spaces. Garden in your apartment, in a little corner of your patio or deck, or indoors all year round. Learn tips, techniques and good ideas on organic gardening, vegetable gardening and flower gardening. Check out dozens of inspiring flower garden designs and find ones that will work in your landscape. Be a hero to the kids. Build them something amazing from our directory of dozens of free, do-it-yourself project plans and how-to guides. You'll find all types of playhouses, play forts, swing sets, play towers, seesaws, wooden toys and more. Here are some big backyard project plans for you. If you need a new one, two, three or four-car garage, click through to see your choices. You'll also find barn-style garages and carriage houses, woodworking shops, hobby shops and easy-to-build carports. Out list includes free software that can help you design your own ideal building and more than fifty sets of ready-to-go construction drawings. 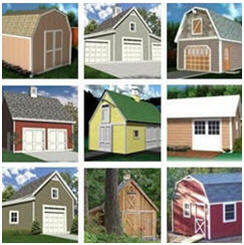 Check out our list of more than sixty barn designs and DIY building guides. For your backyard, you'll find small storage barns, little-pole barns, barn-style sheds, car and tractor barns, shops, studios and even some free software that can help you create plans and material lists for your own inexpensive, custom pole barn. Do you need a new guest room, teenager's bunk room, home office, hobby shop or studio? Think about a little, free-standing cottage in the yard. Our directory of more than one hundred free home plans has tiny houses, little cabins and small cottages that might be perfect for your needs. Raise chickens in your backyard for fresh, healthy eggs, organic garden fertilizer and a rewarding hobby. Find hundreds of DIY plans for backyard coops, moveable "chicken tractors" and pasture pens and easy, automatic waterers and feeders. You'll even find a selection of free plans for stealthy urban and suburban coops that look like sheds and playhouses. Get the most out of your garden. Start growing flowers, vegetables and herbs early in the Spring. Push your harvest of fresh kitchen garden plans and flowers into late Fall and early Winter. Ckeck out dozens of designs for hobby greenhouses, inexpensive hoop-style greenhouses and easy-to-build cold frames. The ultimate backyard project might just be the hobby shop, home office, pool house or studio that you build, or have a contractor build, for yourself. Check out our architect-selected collection of free construction plans.